You are currently browsing the tag archive for the ‘David Letterman’ tag. ELECTION junkies in acute withdrawal need suffer no longer. Though the exciting Obama-McCain race is over, the cockfight among the losers has only just begun. The conservative crackup may be ugly, but as entertainment, it’s two thumbs up! In an exuberant class by himself is Michael Barone, a ubiquitous conservative commentator who last week said that journalists who trash Palin (more than a few of them conservatives) do so because “she did not abort her Down syndrome baby.” He was being “humorous,” he subsequently explained to Politico, though the joke may be on him. Barone writes for U.S. News & World Report, where his 2008 analyses included keepers like “Just Call Her Sarah ‘Delano’ Palin.” Just call it coincidence, but on Election Day, word spread that the once-weekly U.S. News was downsizing to a monthly — a step closer to the fate of Literary Digest, the weekly magazine that vanished two years after its straw poll predicted an Alf Landon landslide over Franklin Delano Roosevelt in 1936. Will the 2008 G.O.P. go the way of the 1936 G.O.P., which didn’t reclaim the White House until 1952? Even factoring in the Democrats’ time-honored propensity for self-immolation, it’s not beyond reason. The Republicans are in serious denial. A few heretics excepted, they hope to blame all their woes on their unpopular president, the inept McCain campaign and their party’s latent greed for budget-busting earmarks. The trouble is far more fundamental than that. The G.O.P. ran out of steam and ideas well before George W. Bush took office and Tom DeLay ran amok, and it is now more representative of 20th-century South Africa during apartheid than 21st-century America. The proof is in the vanilla pudding. When David Letterman said that the 10 G.O.P. presidential candidates at an early debate looked like “guys waiting to tee off at a restricted country club,” he was the first to correctly call the election. On Nov. 4, that’s roughly the sole constituency that remained loyal to the party — minus its wealthiest slice, a previously solid G.O.P. stronghold that turned blue this year (in a whopping swing of 34 percentage points). The Republicans lost every region of the country by double digits except the South, which they won by less than double digits (9 points). 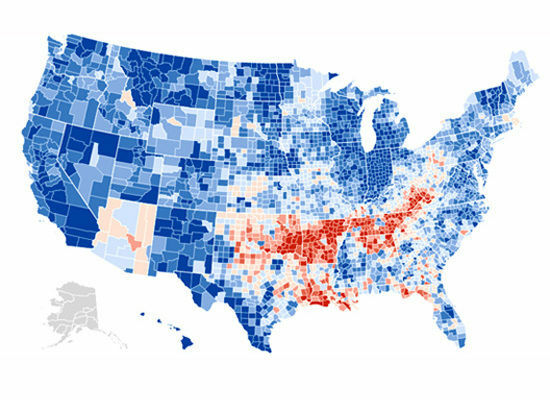 They took the South only because McCain, who ran roughly even with Obama among whites in every other region, won Southern whites by 38 percentage points. Blue areas show Democrat gains. Well – David Letterman has still not got over the fact that McCain squirreled out of making an appearance on his show – in trying to set up a new date for McCain to appear – he said – I don’t know if we can trust him.